Stereo MC's are a British hip hop/electronic dance group which formed in Clapham, London, in 1985. They had a transatlantic Top 20 with their single "Connected". After releasing eight albums for Island Records, K7, Graffiti Recordings, and Pias, they formed the label Connected with Terranova to release their own material and that of other artists within the house/techno/electronic medium. Vocalist Rob Birch and disc jockey (DJ)/producer Nick Hallam founded their Gee Street recording studio and record label with money they were given to leave their London flat and, dispensing with using a backing band, travelled to early gigs on public transport. As Birch & Hallam they recorded two synth-pop singles in 1983: 'What You Say' and 'Pray For Me', both released on the A&M label. When Gee Street attracted the attention of 4th & Broadway, they recorded the début Stereo MCs' album, 33-45-78 (1989), on a shoestring budget with DJ Cesare, drummer Owen If and backing vocalist Cath Coffey. In 1990, "Elevate My Mind" by the Stereos was the first British hip hop single to reach the United States R&B record chart. Having supported the Happy Mondays on a US tour, in the emerging UK alternative dance scene, it took an alliance with the Jungle Brothers to ensure chart success for Supernatural (1990). Remix work for U2 and Queen Latifah followed. Their live band included singers Andrea Bedassie and Verona Davis, and they were one of the few hip hop outfits to play at rock music festivals at the time. 1992's mainstream breakthrough Connected, a UK Albums Chart #2, contained the hit singles "Connected", "Step It Up", "Creation", and "Ground Level", and won them BRIT Awards for Best Group and Best Album. 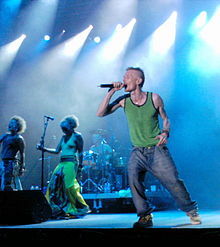 Hallam and Birch then created the music-publishing firm Spirit Songs, which signed Finley Quaye. However, the follow-up to Connected did not appear for almost a decade. Further remix duties for Madonna ("Frozen") and the Jungle Brothers ("Jungle Brother") in 1998 kept the Stereo MCs' name in the limelight. Madonna went on to use the "Frozen" remix on her 2001 Drowned World Tour. In 2000, they released a Disc Jockey mix for Studio !K7's DJ-Kicks series and remixed another song for Madonna ("Music"). The following year saw the release of Deep Down & Dirty, followed by a tour including slots opening for the recently re-united Jane's Addiction. Their sixth studio album, Double Bubble, was released in July 2008, followed by their seventh, Emperor's Nightingale, in August 2011. In December 2008, they supported Madness at the O2 Arena in London. 'The Head' – born Nick Hallam, 11 June 1960, Nottingham, England. 'Rob B' – born Robert Charles Birch, 11 June 1961, Ruddington, Nottinghamshire, England. 'Owen If' – born Ian Frederick Rossiter, 20 March 1959, Newport, Monmouthshire, Wales. "We Belong in This World Together"
"—" denotes single that did not chart or was not released. The song "Wake Up" Appeared in the Shopping soundtrack and on the compilation album of film soundtrack songs, Trackspotting. ^ a b c d e f g h i j Strong, Martin C. (2000). The Great Rock Discography (5th ed.). Edinburgh: Mojo Books. p. 935. ISBN 1-84195-017-3. ^ "KOMPAKT.FM // BLOG // Read: Terranova and Stereo MC's start new label, Connected + win merch". www.kompakt.fm. Retrieved 19 November 2015. ^ a b c d e f Roberts, David (1998). Guinness Rockopedia (1st ed.). London: Guinness Publishing Ltd. p. 420. ISBN 0-85112-072-5. ^ "Birch And Hallam Discography - UK - 45cat". www.45cat.com. Retrieved 19 April 2018. ^ "Interview with Rob B of Stereo MC's". chaoscontrol.com. 21 March 2015. Retrieved 19 April 2018. Top 50 peaks: "Stereo MC's - Australian Chart". australian-charts.com Hung Medien. Retrieved 16 October 2011. Top 100 peaks: Ryan, Gavin (2011). Australia's Music Charts 1988–2010. Mt. Martha, VIC, Australia: Moonlight Publishing. ^ a b Roberts, David (2006). British Hit Singles & Albums (19th ed.). London: Guinness World Records Limited. p. 528. ISBN 1-904994-10-5. ^ "Stereo MC's - UK Chart". Official Charts Company. Retrieved 4 January 2016. 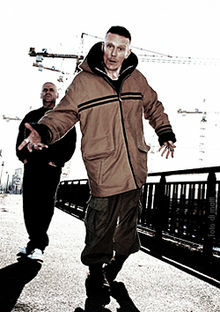 ^ "Stereo MC's - Irish Chart Search". Irish Recorded Music Association. Retrieved 5 May 2012. ^ "Stereo MC's - Dutch Chart". dutchcharts.nl. Retrieved 4 January 2016. ^ "Stereo MC's - Flemish Chart". ultratop.be Hung Medien. Retrieved 16 October 2011. ^ "Stereo MC's - French Chart". lescharts.com Hung Medien. Retrieved 16 October 2011. ^ "Stereo MC's - Swiss Chart". hitparade.ch Hung Medien. Retrieved 16 October 2011. ^ "Stereo MC's - German Chart". germancharts.de. Retrieved 4 January 2016. ^ "Stereo MC's - Austrian Chart". austriancharts.at Hung Medien. Retrieved 16 October 2011. ^ "Stereo MC's - Swedish Chart". swedishcharts.com Hung Medien. Retrieved 16 October 2011. ^ "Stereo MC's - New Zealand Chart". charts.org.nz Hung Medien. Retrieved 16 October 2011. ^ "Stereo MC's - US Hot 100". billboard.com. Retrieved 4 January 2016. ^ "Stereo MC's - US Alternative Songs". billboard.com. Retrieved 4 January 2016. ^ "Stereo MC's - US Dance Club Songs". billboard.com. Retrieved 4 January 2016. ^ "Various - Shopping". Discogs.com. Retrieved 10 October 2015. ^ "Various - Trackspotting". Discogs.com. Retrieved 10 October 2015.